This last weekend NEW SUN PRODUCTIONS debuted and tested a solar tent with a swamp cooler at the HUDSON RIVER CLEAR WATER FESTIVAL in New York. Even with the region's humidity the event was a success and the cooler ran continuous all day Sunday providing slight cooling for the 10X10 space. June 21-25 the tent will be up and running at racer registration for PRIMAL QUEST ADVENTURE RACE at the red cliff lodge in Moab Utah. 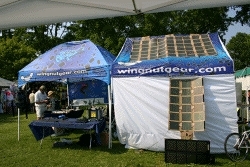 The solar tent is part of an ongoing project to create an environmenatlly focussed tour kit for 2007. The results from these first two tests will then be used to make a second tent to be presented at the Outdoor Retailer show in S.L.C. Utah in August, and then later at the Interbike tradeshow in Las Vegas. with a final stop back in Moab at the 24 hour race. Other venues may be added, schedule permitting. NEW SUN PRODUCTIONS is currently using their in-house brand WINGNUT to promote the tent to the cycle market, and hope to get others involved with the tour concept as it progresses. Special thanks goes out to GLOBAL SOLAR who have been working with New Sun since January 2006 on this and other solar projects. Their high efficiency light weight panels are making this type of utilization of solar possible for the first time. Questions invloving tour schedules and involvemnet can be forwarded to Eddie O'dea at (404) 432-5841. Solar system technical questions please direct to Scott Gibson (845) 430-4882 or their listed e-mail addresses. Scott will be in in the desert until the 26th so check in and see how cool the tent is compared to the outside air.